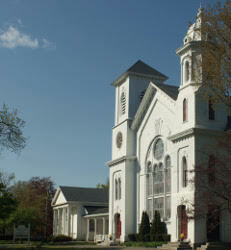 Belleville Church is pleased to offer space for rent to various community groups and individuals. We have a number of rooms available for meeting space rental including a large Stage Room with kitchenette, Bannister Room, Parlor and Cafeteria. 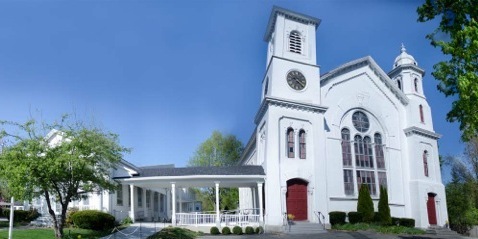 For larger gatherings such as concerts or weddings, there are two additional options: our historic Meeting House which comfortably seats 500 and the Fiske Chapel which seats 120 in pews. Rental fees are broken into winter and summer rates. The winter rate runs from October 15 - March 31 and is $65/hour with a two hour minimum. Summer rates are April 1 - October 14 and are $45/hour with a two hour minimum. The Meeting House has separate rental rates which are $500/day plus an oil surcharge to heat the building any time of the year. For more information about renting space at Belleville Church, please contact the Church Office at ph: 978/465-7734 or office@belleville-church.org. If you wish to make a gift to Belleville's Memorial Fund in the memory of a loved one please make your check payable to Belleville Congregational Church. Mail your check to: Belleville Congregational Church, ATTN: Memorial Fund Treasurer, 300 High Street, Newburyport, MA 01950 . We have the following boards here at Belleville: Executive, Worship and Education, Fellowship and Outreach, and Finance and Stewardship. Please visit our Boards page for more information. Men's Fellowship, which is a place for supportive conversations and/or topical discussions. Please click on any of the above links to view more information about these groups. 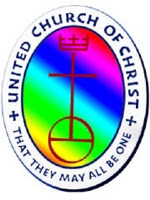 The theme of the capital campaign is "Building Connections—Uniting with God and the Community." The goal is to connect the Meeting House with the Chapel by means of a connector and make other necessary improvements to the Parish Hall Building. Our facilities will then be more accessible and user-friendly to all. How exciting it is to realize we are building on a foundation of 200 years of history at Belleville Congregational Church. Please visit our Capital Campaign page to view photos of our completed Capital Campaign projects. For more information about the Capital Campaign, please contact Bob Locke at ph: 978/465-7734.